Dr. Walter Cooper speaks at TE Luncheon. 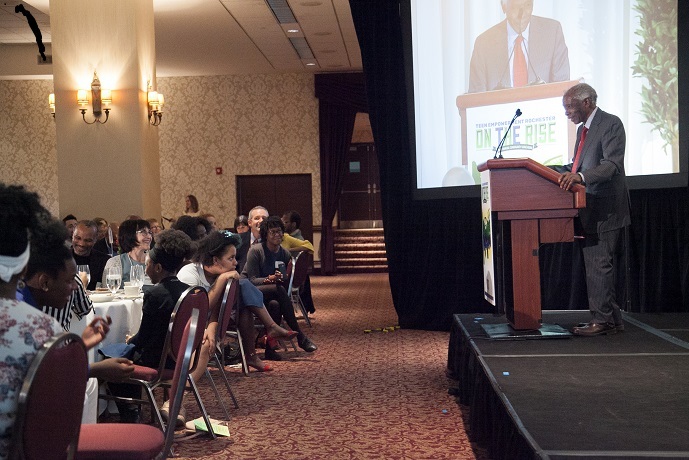 More than 630 guests attended the Center for Teen Empowerment’s 7th Annual “On the Rise” community luncheon at the Rochester Riverside Convention Center, recently. The event honored scientist and community leader Dr. Walter Cooper, with the Champion for Youth Leadership Award, and Kit Miller and the M.K. Gandhi Institute for Nonviolence with the Peacemaker in Action Award. 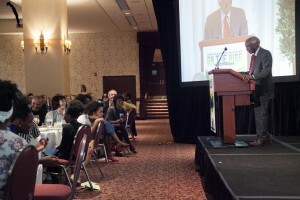 Teen Empowerment holds the luncheon each year in an effort to raise funds to support the center’s youth organizing projects. 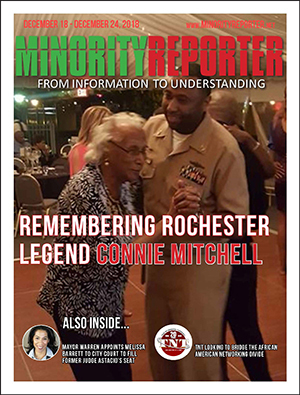 Dr. Cooper has led anti-poverty and community empowerment efforts in Rochester since the early 1960s, and has been a board member of The Community Foundation, Urban League, local NAACP, and Action for a Better Community. He is currently retired from Eastman Kodak Co.
Cooper has also served as a NY regent, and has a Rochester City School named in his honor. In addition, Kit Miller, director of the M.K. Gandhi Institute for Nonviolence, has recently expanded the reach of the institute, sharing nonviolent communication and the pursuit of social justice with over 3,400 people last year, TE said. Teen Empowerment and the Gandhi Institute have worked closely together since 2010, co-hosting trainings and events for youth. The institute also supports school-based restorative practices and conflict resolution skills as part of a collaborative effort with the center to improve school climate in Rochester City Schools. The Center empowers youth and adults as agents of positive individual, institutional, and social change. Each year, TE youth conduct over 150 initiatives involving some 6,000 youth and adults in Rochester, as well as in the Boston, MA area. Since 1992, Teen Empowerment has employed and trained thousands of youth, conducted police-youth reconciliation projects, worked to build relationships and understanding in communities and schools, and helped bring youth voice into the public police debate. The organization’s work has touched the lives of more than 40,000 youth and adults. Visit www.teenempowerment.org for additional information regarding TE.